Three months after Operation Protective Edge, a 50-day air and land offensive against Hamas, was launched, Egyptian President Abdel Fattah al-Sisi, alongside the Norwegian Ministry of Foreign Affairs, hosted an international conference in Cairo dedicated to allocating donations towards the reconstruction of Gaza. The 50-day conflict not only claimed the lives of 2,104 Palestinians and 73 Israelis, but also displaced up to 110,000 people. In the evening of August 26, an Egyptian-brokered ceasefire went into effect and still remains today. While both sides have declared their personal victories, the destruction of Gaza shows the high costs the Palestinian front has suffered. According to the United Nations Office for the Coordination of Humanitarian Affairs (OCHA), 18,000 housing units were destroyed or severely damaged. In addition to this, damage to the Gaza Power Plant by Israeli airstrikes has continued to leave Palestinians with sporadic blackouts, and an additional 450,000 people are unable to access water. Now, the United Nations Reliefs and Works Agency (UNRWA), the organization principally concerned with the post-conflict recovery, is beginning to face a slew of challenges in attempting to rebuild the Gaza Strip. Immediately after the ceasefire went into effect, UNRWA launched a flash appeal, calling for a total of US $295,400,000 in order to provide food, minor repairs, and cash assistance. On October 12, the UNRWA participated in the donor conference in Cairo, and was joined by several other nations in pledging assistance. At the conference, Secretary of State John Kerry pledged a total of $414 million in assistance to the Palestinians, dividing the funds through USAID, UNRWA, and direct humanitarian aid. The conference was hailed as a success, achieving a sum of $5.4 billion in additional aid, which exceeded the $4 billion requested by the Palestinian Authority. While seen as a cause to celebrate, it should be noted that only $2.7 billion was set aside for the purpose of immediate reconstruction, while the rest has been invested into the Palestinian Authority’s budget. Furthermore, the Palestinian Authority has estimated the total cost of rebuilding at $8 billion. As of this writing, the UNRWA seeks an additional $1.6 billion to continue with its recovery efforts. A handful of UNRWA schools have continued to serve as relief centers for approximately 38,000 internally-displaced persons. Although 30,000 homes have been assessed, it is estimated that up to 80,000 homes have been affected by the conflict. The UNRWA has continued to provide food and water to refugees, and has continued to repair its own installations in the Gaza Strip, which had been targeted earlier in the summer. Currently, the UNRWA is undertaking a shelter assessment that is to be completed in November, but are already calling for a higher capacity of labor to continue the assessment. The cause of rebuilding Gaza has not only faced financial obstacles, but also political ones. In order to facilitate the delivery of supplies, the donor conference called for the opening of border crossings. Israel, who had not been invited to the donor conference, alerted the international community, claiming that efforts to rebuild Gaza would require the consent of the government. Israel further warned against the diversion of funding, voicing its concerns about the potential for Hamas to use it to rebuild its intricate network of tunnels. So far, Israel has opened its borders selectively to accommodate private reconstruction and the trickling-in of essential supplies such as cement and iron. Israel’s mistrust inspired the UN to step in and implement strict monitoring measures in order to alleviate concerns, including the installment of security cameras and placement of international inspectors. This plan has been highly controversial, with accusations being made by groups such as al-Shabaka that the UN’s mechanisms only further deepen Israel’s blockade instead of working towards the gradual lifting of it. However, the UN has defended the agreement, claiming that it is maintaining its position against the illegal blockade of Gaza. While the monitoring mechanisms attempt to serve as a short-term solution that seeks to reconcile the trust between Israel and the Palestinian Authority, they fail to answer the call for a long-term solution to bring stability to Gaza. 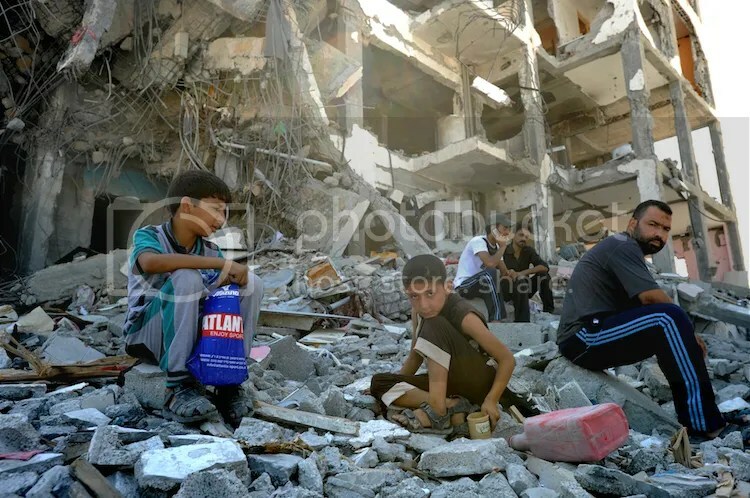 The UNRWA has considered the long-term needs of internally displaced persons within the Gaza Strip, with a section of their Strategic Response to Gaza 2014 Hostilities highlighting the principle of “Reconstruction Towards Development”. In this, the UNRWA has called for the development and reconstruction of Gaza’s refugee camps to better fit the needs of internally-displaced persons. Yet the reconstruction of Gaza should not be solely dedicated to physical infrastructure. Civilians, including children are also in need of support. In the midst of the conflict in August, UNICEF reported that over 373,000 children were in need of “immediate psycho-social first aid”. In the midst of the conflict, UNICEF employed 50 psychologists and counsellors, but had only managed to reach 3,000 children, and had further noted the need for even parents to receive counseling for trauma. During the conflict, children in Gaza had been unable to return to school, delaying classes by several weeks. Now, as children return to schools, they are required to undertake psychological counseling in addition to their usual classes. This is currently being provided by the UNRWA, who has employed 200 counsellors and plans to reach 240,000 students. In addition to the UNRWA, the Palestinian Ministry of Education has also planned to provide additional psychosocial support. Furthermore, development for individuals is also being considered by the UNRWA, who are seeking to expand programs that would provide vocational training to recent university graduates and working opportunities for women. Overall, long-term needs of Gazans have been taken into consideration, with efforts to provide means of mental and physical recovery, as well as education and career initiatives. The recent 50-day conflict in Gaza is in fact the third war in six years. Previous operations have left heavy damage on the Gaza Strip, which is only further made detrimental by Israel’s blockade. Operation Cast Lead, launched in December 2008, left $2 billion in damage, with estimates calling for a reconstruction timeline of three to five years. Operation Pillar of Defense, an eight-day war that occurred in November 2012, left $1.2 billion in damage. Further damaging attacks have occurred between the wars, and the Israeli blockade has also remained costly to inhabitants of the Gaza Strip. In a report published in 2012, the UN warned that the Gaza Strip would become unlivable by 2020 due to lack of adequate water, sanitation and health resources. The support of a blockaded Gaza Strip, along with the continuous damage to both infrastructure and people is becoming highly costly, and donors may be unwilling to contribute if conflict simply re-emerges. Although the UNRWA continues to receive donations, such as the $50,000 recently donated by activist Malala Yousafzai, it will become difficult to continue to petition donors to rebuild if infrastructure continues to be destroyed each time a conflict erupts. While it is important to support Gaza by providing immediate humanitarian aid and the means for reconstruction, focus should be placed immediately on long-term reconciliation, including the lifting of the blockade, in order to prevent a fourth Gaza War from emerging.